The Bob Hope Christmas Show racked up more than a million miles during WWII, entertaining the troops in the U.S., Europe, the Pacific Theater and North Africa. He brought his show to Korea in the early 1950s and entertained U.S. troops at military bases in Japan throughout the rest of the decade. U.S. forces in Vietnam were growing quickly by 1962, and Hope lobbied military brass for permission to perform for U.S. servicemen there. Plans moved ahead for a 1963 Christmas Show, but were scrapped when the Pentagon deemed it was too dangerous. Hope continued to press the issue, and was finally granted permission to proceed with December of 1964 Christmas shows. To make logistics even trickier, these performances would be filmed and shown as holiday specials early in the year back in the States. Security for Hope’s shows was exceptionally tight. The locations of Hope’s appearances were kept top secret, and no official confirmation of his performances were made leading up to events. 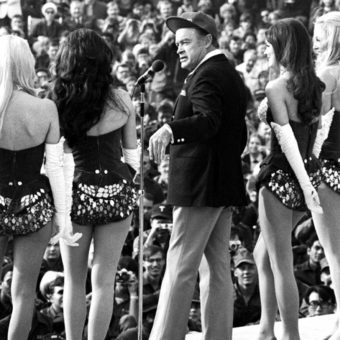 Even Bob Hope and his staff had no idea of the names of the bases they were performing at until they arrived. The troops in the audiences were clueless as to who would be stepping on the stage to entertain them. It was pointed out that Hope’s travel plans were kept more guarded than those of high-level government officials. This was par for the course for all of Hope’s Vietnam Christmas Shows from 1964-1972. However, as entertaining as Hope was, arguably from the troop’s standpoint, the biggest draw was the many lovely ladies who gamely joined the Christmas show, such as Ann-Margret, Jill St. John, and Raquel Welch. By 1972, there had been steady troop withdrawals from Vietnam, so Bob took his Christmas Show to the Philippines, Singapore and Guam as well. On Christmas Eve 1972, he gave his final holiday performance in Vietnam and the next day 1,200 SeaBees at Diego Garcia in the Indian Ocean were treated to a performance, wrapping up a grueling two-week tour. Hope’s efforts were very much appreciated by the troops he entertained during the Vietnam War, but his hawkish views towards the war, particularly in the latter days of it, didn’t win him many friends back home. 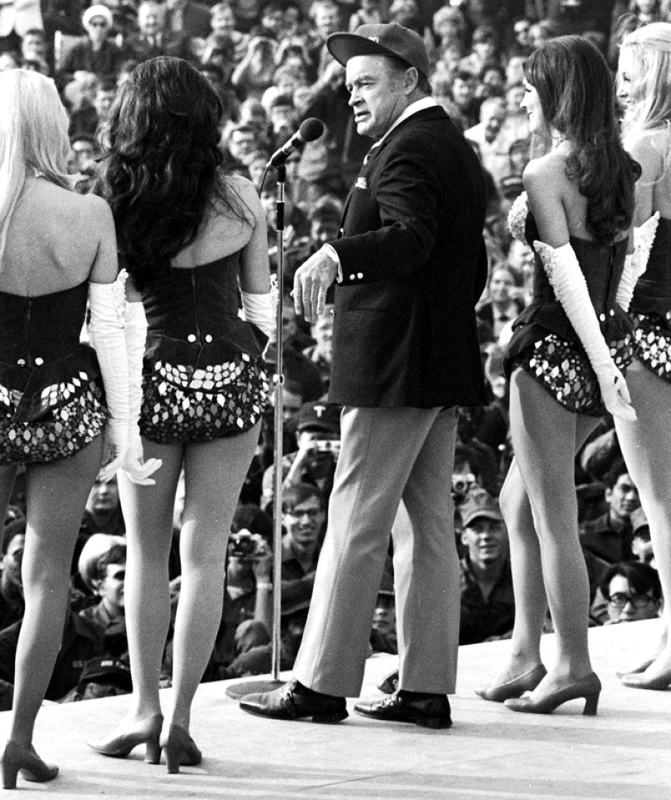 Vietnam had torn the nation apart and Bob Hope, who had spent almost three decades entertaining American servicemen, was not immune to criticism.